Cid Style File: Connect the Dots! Connect the dots, if you follow/read some of the same blogs as I do you will be seeing lots of polka dots this week. 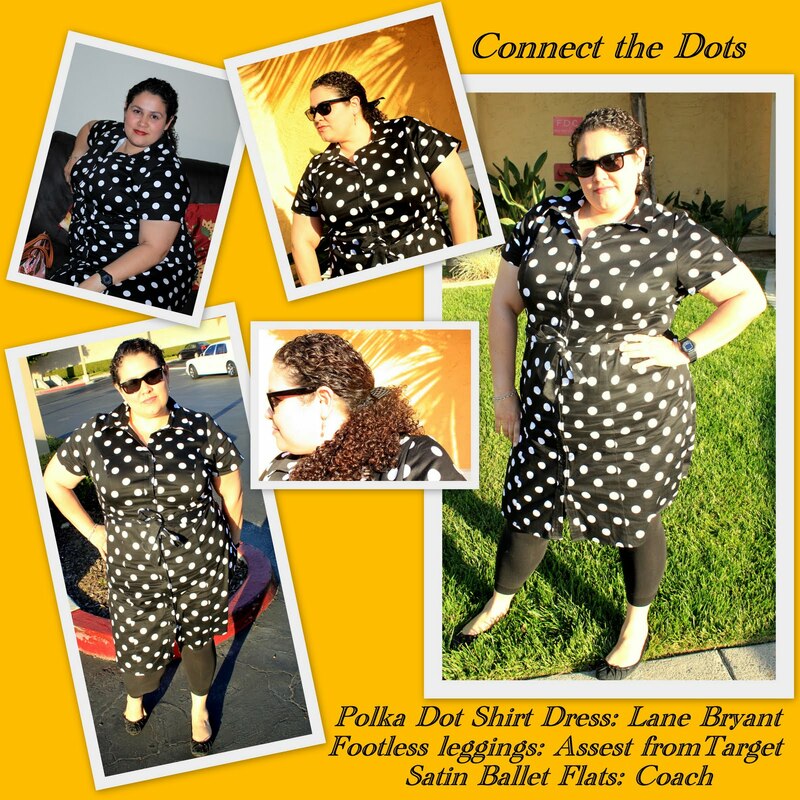 Curves and Chaos did a post about polka dots this week, and featured the Lane Bryant Dress I am wearing. 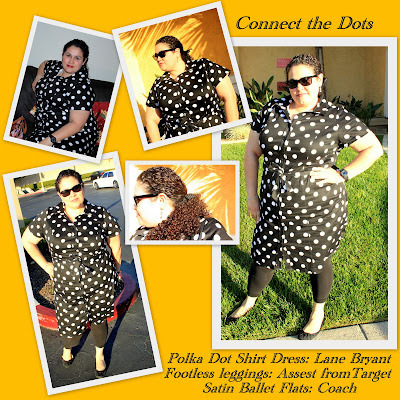 Curvy Girl Chic also did a post about her polka dot dress and I know Diva in Deep Thought is working on a post as well. So what does this all mean? Well it means great fashionista minds think alike, in my opinion! Polka dots is another one of those prints that "fashion experts" would say is a fashion don't for fuller curvy woman. I say who asked for their opinion! I love polka dots, so I wore them! This week I had the pleasure of interviewing people to basically fill my old position at work. It was my first time being the interviewer and not the interviewee. I decided to wear something that looked professional, yet fashionable and not intimidating to the interviewee. Having been in their shoes I knew the feeling, so I thought polka dots might be a good options to say "Hi welcome to the interview! " When I see polka dots I smile and make me happy! Maybe its from my childhood images of going to Disneyland and seeing Minnie Mouse in her awesome red & while polka dot dress. They don't call Disneyland the happiest place on earth for nothing, must be the polka dots! So what do you think when you see polka dots? I actually wore different shoes to work, but they were new so as soon as I got home they flew off. Took pictures on the way to dinner, so flats it was. I usually like to take pics when I an freshly dressed, but this day it didn't happen so hence the wrinkles from sitting all day at work. Also tried a new thing of wearing a bow in my hair, not sure it worked or not, but it looked cute and I liked it!! LOVE that dress on you! :D Pshh girl, showin' me up on the same day! hmph! hehe jkkk! <333 You look gorgeous and as always, I'm so jealous of you--that weather looks amaaaazing! I adore polka dots! They're so fun and classic at the same time. lol, never knew I wasn't supposed to be wearing them as a curvy girl. Love this dress on you. You alway without fail have such a sense of ocassion in your style. Good choice of outfit, I know what its like to be at both ends of the interview process, and yes I agree it helps to have a less intimidating person and more friendly approachable person around. oooh that's a very cute dress! you look lovely :) I don't think polka dots could ever go out of style! I LOVE polka dots and wear them all the time! I tried this LB dress and it was too short on me -- it's perfection on you. Jealous! love that dress... ever want to donate it... let me know... hehe!!! You look AWESOME darling!!! Love that dress on you! You are killing it! May just have to be a look of the week! yeah!!!!!!!!! !so cute!!! Even if I don't like polka dots on me, I adore it on you!!! woop woop, what a hottie! :D love polka dots on you. I love dots! That dress rocks with the tights. One of my favorite shirts was red with large dots like that. It was a sheerish shirt. Someone stole it from a locker room. I still mourn it's loss. I love this dress on you, especially after seeing you wear it in the video! You look gorgeous. Definitely feeling the polka dots. Last Saturday, I wore my blue and white polka dot dress from FAith 21 and polka dots are an awesome way to go if you want ot standout. You look great. I am now a follower of your blog. Polka dots are always so cute and you look adorable in that dress!